After a training-camp season full of quarterback stability (only Arizona made an in-camp change), a whopping eight teams ran into quarterback issues by Week Two. Below, we compare the significance of these quarterback issues, given how close teams are to contending and how good the quarterback options are. We’ll do this using Football Relativity, with the 10 level noting the most pressing QB quandary and the 1 level marking one that doesn’t change a team’s fortunes at all. 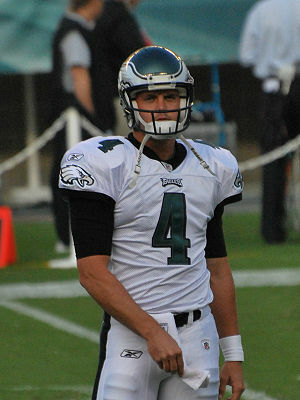 10 – Philadelphia Eagles (Kevin Kolb or Michael Vick) – Kolb missed Week 2 due to the after-effects of a concussion, and Vick had a big game against the Lions. Vick has completed 64 percent of his passes and thrown for three TDs without an interception, and he has run for 140 yards. He looks revitalized after a disappointing return to the NFL in 2009. At first, the Eagles said they’re sticking with Kolb, who became the franchise quarterback when Philly traded Donovan McNabb. But then the Eagles reversed field (a Vick-ian maneuver) and named Vick the starter not just for Week 3 but going forward. It’s shocking that the Eagles pulled the plug on Kolb after just one half on the field, but Vick’s solid performance won the day. The question is what happens if Vick’s two good games turn into inconsistent play. Philly is a talented team, but unless Vick really is back, the way they’ve handled their QB situation could end up scuttling the season. 8 – Tennessee Titans (Vince Young vs. Kerry Collins) – After three turnovers, Vince Young was yanked out of the Titans’ loss to the Steelers, and Collins came in to lead Tennessee’s only TD-scoring drive. Of course, Collins also had two turnovers as well. Jeff Fisher has said there’s no question that Young is the starter, but Collins is a capable quarterback who proved in 2008 he can step in for Young and lead the Titans to the playoffs. (Of course, in 2009 Young replaced Collins and led the Titans from an 0-6 start to an 8-8 finish.) So Young needs to perform well in the next couple of games, or else the clamor for Collins will really pick up. 6 – Carolina Panthers (Matt Moore vs. Jimmy Clausen) – The Panthers are making the switch from Moore, the December superstar in ’07 and ’09, to the rookie Clausen after Moore turned the ball over six times and failed to generate much offense in his first two starts. Clausen is polished for a rookie, but he’s still just a rookie who will make mistakes. Given the talent Carolina has elsewhere on the field, quarterback play that rises from putrid to mediocre could help, but the question is whether Clausen is wily enough at this point to be even that small of an upgrade over Moore. 5 – Arizona Cardinals (Derek Anderson vs. Max Hall) – The Cardinals opted for Anderson, a scattershot quarterback with a big arm, over the cautious check-down man Matt Leinart in training camp, but Anderson’s inconsistency has outweighed his potential thus far. Hall, a rookie out of BYU, lurks as a potential replacement. Hall is more of a quick-hitting trigger man who doesn’t have the big arm but might be better equipped to get the ball to Arizona’s strong stable of receiving targets. So if Anderson struggles and the Cards start to fall behind in the lowly NFC West, Hall will get a shot. 4 – Oakland Raiders (Bruce Gradkowski vs. Jason Campbell) – The Raiders brought in Campbell to bring stability to the QB position in place of JaMarcus Russell, but Campbell lasted six quarters until he was benched. Campbell has talent, but he makes enough mistakes to offset his ability to throw the ball downfield. Gradkowski is a Jeff Garcia-type of scrapper who doesn’t have a big arm but does find ways to move a team. The question is whether Gradkowski would be exposed if he played 3-4 games in a row. But for now, the Raiders should try to keep the spark Gradkowski lit last week aflame. 3 – Pittsburgh Steelers (Charlie Batch vs. Byron Leftwich) – Dennis Dixon won the Steelers’ September starting job in training camp, but he suffered a torn meniscus against Tennessee that will sideline him at least until Ben Roethlisberger returns. So now Pittsburgh must choose between Batch, the ultimate placeholder, and Leftwich, who had some good games for Pittsburgh back in 2008 but looked awful for the Bucs last year. Leftwich may have a little more upside, but he’s got such a slow delivery at this point that Batch might actually be less of a liability. But the bottom line is that the Steelers will win the next two games because of defense, not Batch or Leftwich, and so in the end it really doesn’t matter much which guy starts. 2 – Jacksonville Jaguars (David Garrard vs. Todd Bouman) – Garrard threw four picks against the Chargers and was replaced by Luke McCown, but McCown blew out his knee at the end of the game and will miss the rest of the season. Jacksonville brought back Bouman to be Garrard’s backup, but the injury means there’s no question that Garrard is the guy. 1 – Buffalo Bills (Ryan Fitzpatrick vs. Trent Edwards) – The Bills made the switch from Edwards to Fitzpatrick, but both quarterbacks have frankly proved that they’re not good enough to be regulars on the NFL level. No matter who plays, the Bills are among the league’s worst teams in terms of QB play, and they have few hopes of winning.